INTRODUCTION: There is much subjective discussion, but few empirical data that explore how students approach the learning of anatomy. AIMS: Students' perceptions of successful approaches to learning anatomy were correlated with their own approaches to learning, quality of learning and grades. METHODS: First-year medical students (n = 97) studying anatomy at an Australian university completed an online survey including a version of the Study Process Questionnaire (SPQ) that measures approaches to learning. The quality of students' written assessment was rated using the Structure of Observed Learning Outcomes (SOLO) taxonomy. Final examination data were used for correlation with approaches and quality of learning. RESULTS: Students perceived successful learning of anatomy as hard work, involving various combinations of memorisation, understanding and visualisation. 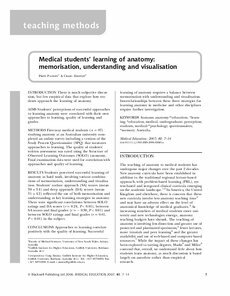 Students' surface approach (SA) scores (mean 30 +/- 3.4) and deep approach (DA) scores (mean 31 +/- 4.2) reflected the use of both memorisation and understanding as key learning strategies in anatomy. There were significant correlations between SOLO ratings and DA scores (r = 0.24, P < 0.01), between SA scores and final grades (r = - 0.30, P < 0.01) and between SOLO ratings and final grades (r = 0.61, P < 0.01) in the subject. CONCLUSIONS: Approaches to learning correlate positively with the quality of learning. Successful learning of anatomy requires a balance between memorisation with understanding and visualisation. Interrelationships between these three strategies for learning anatomy in medicine and other disciplines require further investigation.